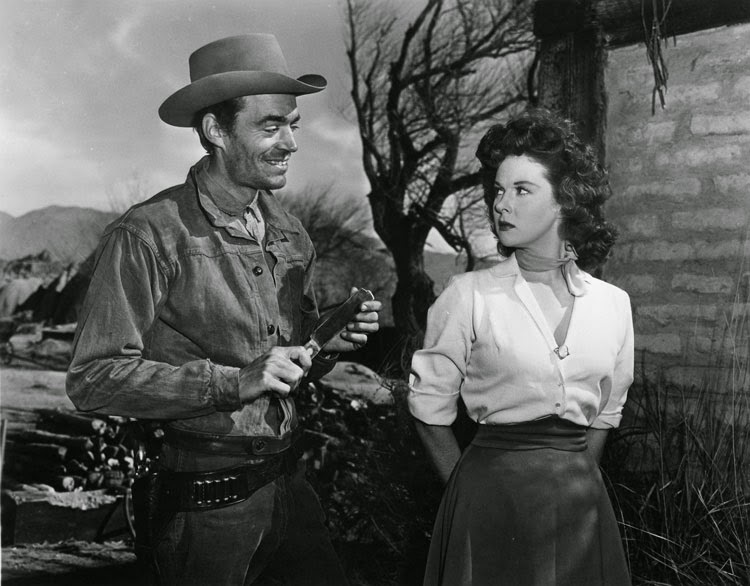 An often overlooked Western, Rawhide is a tense and compact hostage drama set at an isolated overland mail outpost. Rawhide Pass is a remote rest stop for the Overland Mail Company, on the treacherous yet popular route to deliver mail, passengers and cargo via stagecoach between San Francisco and St. Louis in 25 days. Grizzled veteran Sam Todd (Edgar Buchanan) is the stationmaster, and he is assisted by the inexperienced Tom Owens (Tyrone Power), who is still learning the business. The mysterious Miss Vinnie Holt (Susan Hayward) arrives at Rawhide on the eastbound wagon, accompanying a young child named Callie. 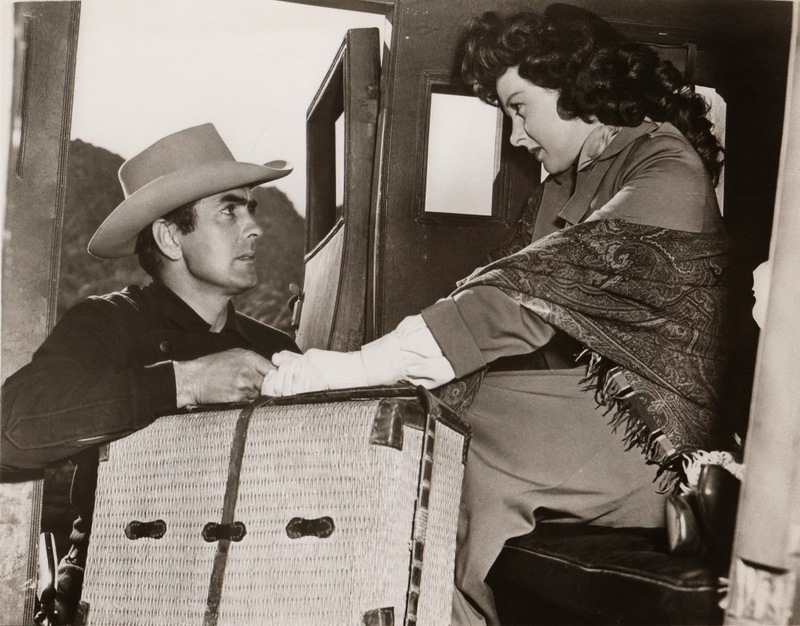 But Miss Holt and Callie are forced off the wagon and asked to spend the night at Rawhide as a safety precaution, because convicted criminal Rafe Zimmerman (Hugh Marlowe) has broken out of prison and is threatening the safety of stagecoaches in the area. Miss Holt is beyond irritated and immediately clashes with Tom. But things get a lot worse when Zimmerman and three other escaped inmates, including the borderline psychotic Tevis (Jack Elam), arrive at Rawhide, dispatch of Sam, and take control of the station. Zimmerman wrongfully jumps to the conclusion that Vinnie and Callie are Tom's wife and child, and holds them hostage to manipulate Tom into cooperating. Zimmerman and his men intend to ambush the eastbound coach arriving the next day and carrying a large quantity of gold. Tom and Vinnie have to find a way to tolerate each other, maintain the pretense of a married couple, and survive the ordeal. Playing with some of the same themes from The Petrified Forest (1936) and Key Largo (1948), Rawhide is less about action and more concerned with establishing a remote, cut-off location, exploring bubbling tensions within a small group under stress, and presenting an intelligent antagonist with a back story, struggling to maintain control of his shifty allies and terrified hostages. The ingredients are mixed well by director Henry Hathaway, and the result is a taut 89 minute exercise in character dynamics. The Dudley Nichols script gets most things right. Tom and Miss Holt get off on the wrong foot, creating a natural conflict that is only made worse when they are mistaken for husband and wife. And on the other side, the dangerous Tevis is introduced as an unstable member of the invading gang, injecting a source of volatility that Zimmerman will rarely have full control over. And finally, little Callie is the most vulnerable hostage, and also a delightful catalyst capable of generating doses of unpredictability. It can be argued that Zimmerman would have been better off ambushing the gold-laden stagecoach on the trail rather than at Rawhide, and his background and motivations would have benefited from some additional elaboration. When Zimmerman's crimes are revealed it is others who do the talking, and the film would have been enriched had the escaped convict himself had an opportunity to tell his story. But Hathaway keeps the narrative moving and the stress mounting, as deep fractures appear among the outlaws, and Tom and Vinnie reach the limit of their tolerance for captivity and the charade of marriage. Tyrone Power demonstrates welcome vulnerability as a man who is afraid and devoid of answers, while Susan Hayward brings her typical fieriness to the role of Vinnie Holt, a strong woman having to deal with a large number of men, many of them dangerous. Marlowe as Zimmerman is adequate, but more handsome than menacing. Jack Elam gets a larger supporting role than usual, and with an everpresent sneer, he ensures that Tevis is a memorably despicable villain. As effective as the pioneering overland mail service it celebrates, Rawhide delivers the goods with admirable efficiency.